The kit consists of 7 individual blends of precious essential oils of 2.7ml each. These are specially formulated to cleanse, heal, balance and expand each Chakra and the Chakra system as a whole. These Chakra oils are so pure, undiluted and potent that we need use only one drop on each Chakra point. Full instructions with advice for various uses, plus affirmations, come with the kit. The Chakras are rotating vortices of subtle energy which helps connect our bodymind with the higher realms of existence (the Prana life force). They function like step-down ‘energy transformers’ which bring in the Prana subtle energies from the higher planes of consciousness to connect with 7 key energy Chakra points in the body. Each Chakra corresponds with a specific endocrine gland in the body and governs a particular region of our bodymind. If the Chakra is blocked or interfered with, then mental, emotional and physical imbalances may result. Balancing these energies can promote mental, physical and spiritual ‘health’ – and the Essential Chakra Oil Kit helps open your Chakra points to begin that process. Since the Chakra Kit was developed in 1996, thousands of people have tried and continue to use the kit. The loyalty and praise for this product is outstanding – best shown in the volume of re-orders. Why? This kit has gained momentum in its ability to open, cleanse, heal, expand and illuminate our chakras – the key to our energy system and spiritual growth. The formula for the kit’s oils was given to its creator, Carol Asher, by divine guidance more than 25 years ago and since then its energetic properties have seemed to grow. In March 2004 the kit’s powers were formally acknowledged by being blessed by one of India’s leading Avatars* and since then its spiritual powers have stepped up even more! People have reported back that the oils have ‘changed’ in potency and in frequency. “The Chakra Kit allows the individual to balance the energy centres while making necessary changes and healing past wounds in a peaceful manner. There are many oils and blends on the market, what makes One Heart products so superior is the integrity, the personalised attention, the care and the intent in which each blend is prepared. “I have found using the Chakra Kit to be most beneficial, not only for myself but also for my young children. The children enjoy the wonderful scent of the oils as well as the gentle application to their chakra points. I have also found that each time the Chakra Kit is used, the children sleep soundly during the night. “At times when I felt “out of whack” or unbalanced, even fearful I would use Rescue Remedy. 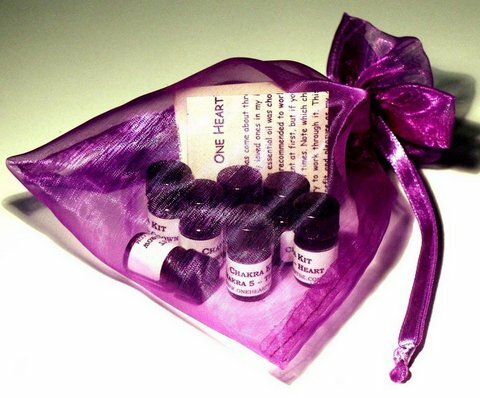 I have recently begun using the One Heart Chakra Kit. “In the past few months, I have encountered experiences that have thrown me way out of my comfort zone. At times I felt almost like I was about to “lose it”. Probably the best way to describe this recent state of being is a ‘mid life crisis’. “I used the Chakra kit oils when I thought that I just couldn’t cope with the myriad of feelings that were racing through me. Within moments of working with the oils I experienced calm that felt like the hand of God stroking my back to reassure me that I could cope and that I was taken care of.